Create a service account. 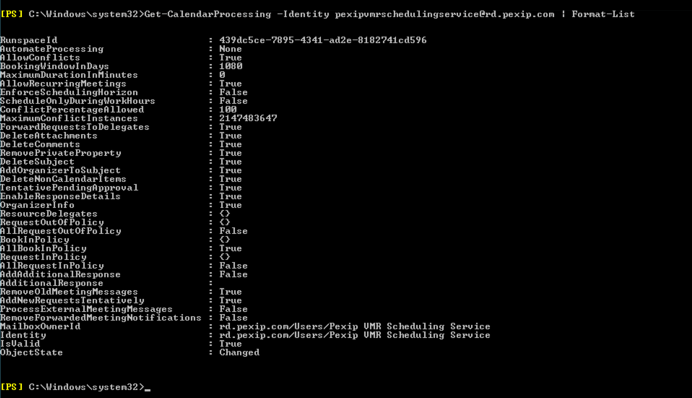 The Pexip Infinity VMR Scheduling for Exchange feature uses a service account to log into Exchange. 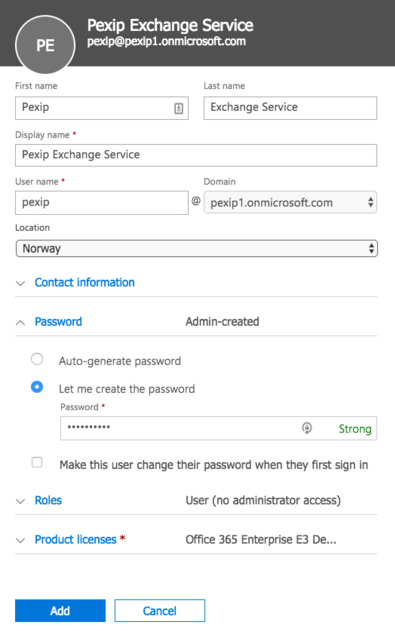 You need to provide the username and password of this service account when configuring Pexip Infinity to integrate with a Microsoft Exchange deployment. A single service account can be used by more than one Pexip Exchange Integration. Changes to the service account may take some time to take effect, depending on the cache lifetime configured on the Microsoft Exchange server. Configure Application Impersonation on the service account. The service account must be configured with a Role of Application Impersonation. This role allows the service account to impersonate users on Exchange. For example, the VMR Scheduling for Exchange service impersonates users when sending email updates containing joining instructions (in cases where these instructions could not be added at the time of scheduling). This makes it appear to the recipients that the joining instructions were sent from the meeting organizer, instead of the service account. The Application Impersonation role must allow the service account to impersonate all users who will be using VMR Scheduling for Exchange, as well as the equipment resource that is to be used. For more information, see Using application impersonation. Create an equipment resource. The VMR Scheduling for Exchange service works by adding a specific equipment resource as an attendee to all meetings scheduled using the Pexip add-in. The scheduling service monitors the equipment resource's mailbox, processes all meeting requests sent to it, and schedules the meetings as appropriate. An equipment resource can only be used by a single Pexip Exchange Integration. If you have separate test and development environments, you must use a different resource for each. Enable basic authentication (for Exchange on-prem). These steps are slightly different for Exchange on-prem and Office 365, and instructions are given for each below. 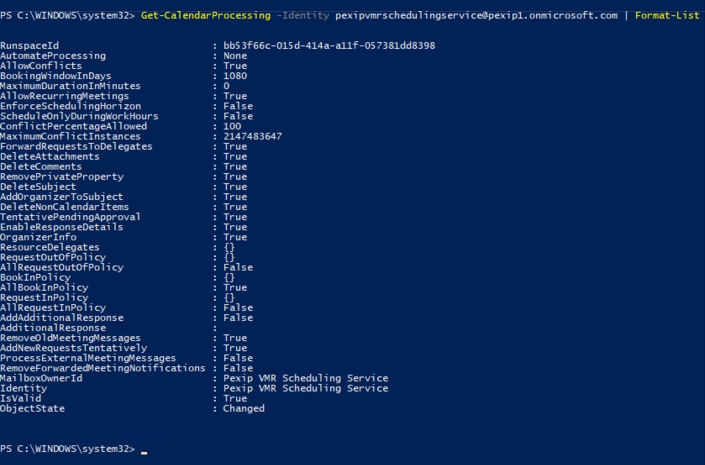 PowerShell commands are provided for all steps; parameters to be replaced with your own relevant information are shown in the format <your info here>. Before you start, ensure you have access to your Exchange Admin Center (EAC) web interface, and access to Exchange Management PowerShell. The VMR Scheduling for Exchange service uses a service account to log into Exchange. You can use an existing service account (the same service account can be used by more than one Pexip Exchange Integration), or create a new account. Log in to your Exchange admin center and go to recipients > mailboxes. Add a new mailbox for the service account by selecting the + icon and then User mailbox. Uncheck the Require password change on next logon box. The first command lets the administrator type in a password for the service account as a secure string. This password variable is then used in the second command to create a mailbox for the service account. The third command ensures the password of the service account will not expire. New-Mailbox -Name "<Account Name>" -UserPrincipalName "<UPN>" -Password $password -Alias "<Account Alias>" -FirstName "<Account First Name>" -LastName "<Account Last Name>" -DisplayName "<Account Name>"
New-Mailbox -Name "Service Account" -UserPrincipalName pexip@rd.pexip.com -Password $password -Alias pexip -FirstName Service -LastName Account -DisplayName "Service Account"
Previously we recommended using a room resource, but this may cause issues if users are using the Room Finder tool. For this reason, we now recommend using an equipment resource. Log in to your Exchange admin center. Go to recipients > resources. Give the equipment resource a name and alias. The equipment name will appear as the location of any meeting requests, and as a recipient. New-Mailbox -Equipment -Name "<Equipment Name>" -Alias "<Equipment Alias>" -DisplayName "<Equipment Name>"
If you are using on-prem Exchange you need to ensure basic authentication is enabled for Exchange Web Services (EWS). When basic authentication is enabled, Pexip Infinity stores the credentials in encrypted form and all authentication is carried out over a secure TLS channel. 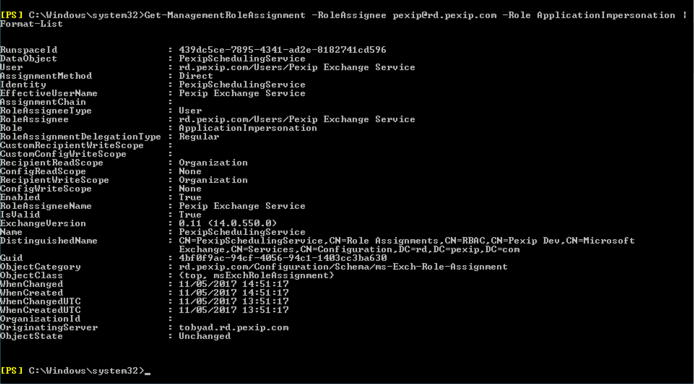 Go to the Windows server on which Exchange is installed and open the Service Manager. Select the server on which Exchange is installed, and right-click to select Computer Management. From the panel on the left, select Services and Applications > Internet Information Services (IIS) Manager. Expand the options and select Sites > Default Web Site > EWS. Select the Authentication button in the main pane. Before you start, ensure you can access your Office 365 Admin Center: https://portal.office.com/adminportal/home#/homepage. 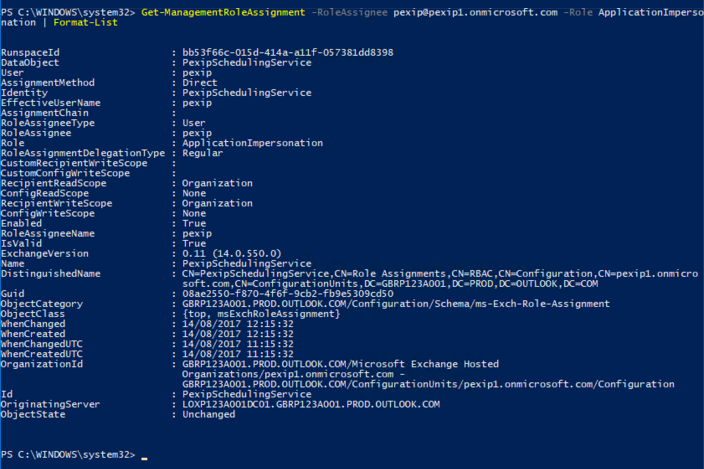 You will also need to have a remote PowerShell session to your Exchange server. To enable this, follow the instructions at: https://technet.microsoft.com/en-us/library/jj984289(v=exchg.160).aspx. Note that for Office 365, the service account must have a mailbox license and appropriate licenses to allow it to connect to Exchange and use EWS. Go to portal.office.com and log in as the administrator. Go to the admin portal by selecting the Admin tile (this will take you to https://portal.office.com/adminportal/home#/homepage). From the Users section, select Add a user and complete the necessary fields. uncheck Make this user change their password when they first sign in. In the Product licenses section, assign an appropriate product license from the available list. Select Add to create the user. New-Mailbox -Name "<Account Name>" -MicrosoftOnlineServicesID "<UPN>" -Password $password -Alias "<Account Alias>" -FirstName "<Account First Name>" -LastName "<Account Last Name>" -DisplayName "<Account Name>"
From the left-hand menu, select Resources > Rooms & equipment and then Add. Select a Type of Equipment. Assign an appropriate Name and Email address and select Add. The equipment resource should now appear in the list of resources. The use of Exchange impersonation is common in business applications that work with mail, when a single account needs to access many accounts. The VMR Scheduling for Exchange feature requires that the service account is configured to use impersonation to send emails on behalf of all VMR Scheduling for Exchange users. If an invitation was sent when the Management Node was offline. In this case, when the Management Node comes back online it will generate a new alias and joining instructions for the meeting. It will then update the meeting invitation using impersonation, so that it appears as though the meeting organizer is sending out the updated joining instructions to all the attendees. When the scheduling recovery tool is run after the Management Node has been restored from a backup. The recovery tool queries the room resource mailbox and finds all meetings that have previously been accepted, and checks whether they are in the scheduling service's database. If not, the Management Node will generate a new alias and new joining instructions for that meeting. This meeting update is sent using impersonation so that it appears as though the meeting organizer is sending out the updated joining instructions to all the attendees. https://docs.microsoft.com/en-us/exchange/client-developer/exchange-web-services/impersonation-and-ews-in-exchange for guidelines on when to use impersonation in your Exchange service applications. https://blogs.msdn.microsoft.com/exchangedev/2009/06/15/exchange-impersonation-vs-delegate-access/ for information on the differences between impersonation and delegate access. 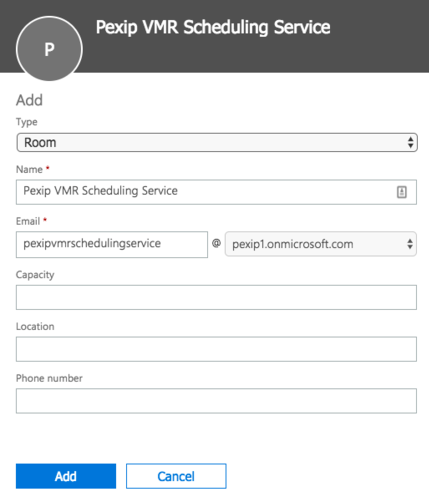 Configuring Pexip Infinity to integrate with your Microsoft Exchange deployment and create the VMR Scheduling for Exchange add-in.